This extremely flexible, professional, short-throw LCD projector is predestined for business and educational use. 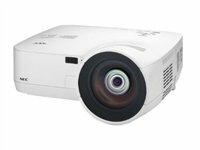 Your projector is setup and ready to display your presentation about 4 seconds after powering on, with the NEC quick start function. The quick power off function stops the cooling fan immediately after turning off the power to the projector, which makes it possible to remove the projector quickly. For a rapid shut down, the projector can be turned off without powering off the projector using the direct power off function and a power strip equipped with a switch and breaker. The projector employs the carbon meter indicating the reduced amount of CO2 emissions in eco mode. Visually confirm the numerical value indicating the reduction in CO2 emissions in comparison with normal mode operation.